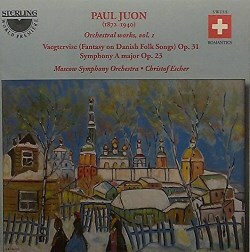 Paul Juon was a Russian-German-Swiss composer born in Moscow. The Swiss connection is accounted for by his Swiss parents and the fact that his last years were spent in Vevey (1934-40). Studying in Russia, his teachers were Taneyev and Tchaikovsky-disciple, Arensky. He moved, early on, to Berlin and furthered his academic training there with Woldemar Bargiel. The Berlin School of Music retained him on the academic staff and over the years his pupils included Skalkottas, Vladigerov, Trapp, Kilpinen, Jarnach and Wolpe. His far from voluminous catalogue has an emphasis on chamber works. There are no fewer than six piano trios, four string quartets and three violin sonatas. We have reviewed his chamber music on CD (CPO 7772782 ~ CPO 7775072 ~ Gallo CD876) as well as one disc of his music for piano four hands (review). Most recently there has been a CPO double of the four string quartets and another of his winning miniatures unusually laid out for two violins and piano (review). There are also three violin concertos (Naxos must surely be eyeing these up; I hope so) but he also left us two possibly intriguing twenty minute works: Jotunheimen (1924) - a tone poem for two pianos and Mysterien (1928 - some sources say 1914) - a symphonic poem for cello and orchestra after Knut Hamsun. Juon died in Vevey on 21 August 1940. On 26 November that year the Symphonie Rhapsodique, the Tanz-Capricen, the Burletta for violin and orchestra and the Sinfonietta capricciosa were played at a Radio Beromünster (Swiss) concert when the conductor was Hans Haug. In 1940 the Berliner Philharmonisches Orchester also had a memorial concert for Juon. Although Juon did not go in for numbering his symphonies he seems to have been partial to the format. In addition to the two early symphonies on these discs there are others: a 1905 Chamber Symphony and a 1929 Small Symphony for student string orchestra as well as a Sinfonietta Capriccioso from the late 1930s. Early on Juon was dubbed the 'Russian Brahms'. While I detected no evidence of that in his Symphonie Rhapsodique (1938), recently revived at Salford Quays by John Storgårds and the BBC PO (review), the Hamburg composer is certainly a rampant presence in the symphonies opp. 10 and 23. The music of the Op. 23 work (Symphony No. 2) skips lightly along but is not immune to more thoughtfully autumnal moments as in the glowing third movement Romanza. Weightier and sometimes turbulent expression, although still elegant and suave, can be found in the finale. The Moscow SO performance seemed only a little rigid in that last movement but it is difficult to apprehend these things when a work has no performing tradition. Brahms also had his hand on Juon's shoulder in the case of the even earlier 1894 Symphony No. 1. There is a barking defiance in the brass but here the predominance lies in a smooth and contented production. It resembles pages from Brahms' Second Symphony. The sauntering and later playful Andantino (II) is more sentimental and Russian-sounding. It's not as superheated as the Tchaikovsky of symphonies 4-6; instead there are parallels with Arensky in his two symphonies. The Allegro vivace is lively and keeps thing moving but its currency lies in charm rather than fire in the belly. The finale begins Adagio but soon strenuously asserts itself. There are some vibrant Tchaikovskian moments. The op. 10 work (Symphony No. 1) came to light in 1997. The conductor Christof Escher edited the material from the autograph and then made this recording. The Second Symphony, op. 23, represented a breakthrough for Juon and it is reported that there were performances of it at the time in Berlin, London, Manchester, Boston and New York. The Rhapsodic Symphony is stronger than either of these two prentice works. Listen out for it on BBC Radio 3 early in 2017. Turning now to the two 'fillers'. First let's look at Vægtervise (Fantasy on Danish Folk Songs). It's an entertaining one movement work indebted to a little song ('The Watchman') embedded in a carillon that Juon heard in the Town Hall, Copenhagen. Its gentle and tinkling echo can be heard chiming away right at the beginning of the work. For all that it is dated 1904 this work evinces no Brahmsian influence. Instead, as Walter Labhart's liner-note makes clear, the voice of Rimsky-Korsakov and the other Imperial nationalists including Borodin and Balakirev is unmistakable. Labhart mentions the Russian Easter Festival Overture and it's a good observation. The Suite (1934), which appears on the other disc, is in five movements: Vorspiel; Walzerskizze; Nachtstück; Kaukasisches Ständchen; and March. The German titles are understandable given that Juon had put down his roots in Berlin for getting on for three decades. That said most of what we hear is Russian nostalgic. The delightful Walzerskizze is more urbane, a dab of Richard Strauss and a gorgeously orchestrated carousel. The moonlit tenderness of the lovely Nachtstück is almost expressionist, It shares a honeyed nocturnal atmosphere with Schoeck's Sommernacht. Kaukasisches Ständchen takes the listener back to the glittering Russian exotic world of the Vorspiel, of Ippolitov-Ivanov's Procession of the Sardar and of Nikolai Tcherepnin. There is a hint of Strauss's Rosenkavalier in here but the 'music-box' chime of bells and piano and the swirling swooning strings make Russian the dominant accent. The imperial splendour and innocence of the glinting sanguine march smiles the Suite to a close. The Suite is the earliest recording here, made in Lugano in 2004, and stockpiled until all the planets were aligned. This happened in 2011 when the two symphonies and Vægtervise were recorded in Russia. Ultimately the two symphonies here meet the expectations of works written by a composer still in his twenties and in the thrall of admiration for Brahms. Yes, as the liner-note indicates, there are Russian strands in the mix but their edge and identity are somewhat turned by the Brahmsian style. Intriguing to have these charmers and never less than a pleasure but they do not have an ineluctable presence. By comparison the less ambitious Suite and Vægtervise have a fresher imprint. Still, well worth hearing if you can. The performances, recording and documentation is admirably done. Notes are in German and in English. There is a useful Juon website which is worth a look.